Every FIFTH Sunday of the month, after celebrating Matins with the Lord's Supper, we enjoy what our members bring (a main dish and side/dessert) for a carry in dinner. Always great food, fun and fellowship! 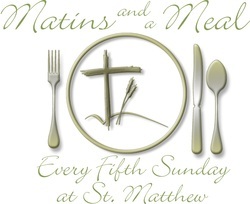 ​Next Matins & Meal Sunday will be December 30.